In the countryside among our olive trees in a wonderful and very peaceful site. 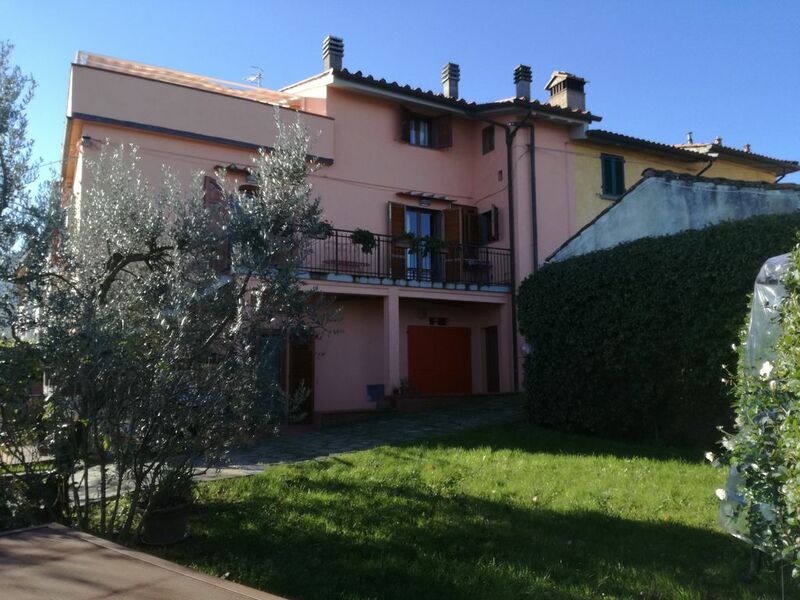 house with large terrace (35 mq) and garden with a very impressive and wide view. Near Pistoia, Florence, Lucca, Pisa and Vinci, you can visit easily all the region.Ideal to relax in the tipical tuscan countryside. Wonderful place to stay. Great time shared with Claudia and Gianfranco !! "This was a wonderful place to stay. It was comfortable, beautiful, peaceful and stunning. Very close to many attractions. Perfect for my husband, myself and his mother. Gianfranco and Claudia are a lovely couple. Thank you!" Die Ferienwohnung liegt malerisch zwischen Olivenhainen und ist von den Kunststädten Pisa und Florenz nicht weit entfernt. Innen ist die Wohnung sauber, bequem eingerichtet und wie beschrieben gut ausgestattet. Besonders toll gefallen hat die Dachterasse von der aus man einen atemberaubenden Blick über die umliegenden Hügel hat. Ein besonderer Dank geht an die aufmerksamen und sehr freundlichen Vermieter, die wesentlich zu einem gelungenen Aufenthalt beitrugen. Wir sagen: Mille grazie für den wunderschönen Urlaub! Danke sehr für die schönen und liebenswürdigen Wörter! Es gefällt uns immer zu viel Gäste wie Beate und ihre Familie zu haben. Un mirador excepcional del largo valle entre Pistoia y Firenze. La cortesía y amabilidad de los dueños, Claudia y Gianfranco, ha sido constante, siempre que los hemos necesitado han estado allí. Un lugar sin duda para repetir, eso sí, mejor más de cuatro días ya que hay muchísimas bellezas artísticas y arquitectónicas que admirar, cuesta creerlo, cuesta casi entenderlo. Nous avons passé une super semaine dans une maison spacieuse et fonctionnelle, au calme, et avec une vie imprenable sur un paysage magnifique! Les propriétaires sont charmants, très accueillants et très disponibles. L' huile d'olive et la confiture de figues maison étaient un délice! Un grand merci à Claudia et Gianfranco pour toutes leurs attentions et leur gentillesse! C'est vraiment une adresse à retenir et nous la conseillerons à toutes les personnes qui veulent passer un bon séjour dans cette superbe région qu' est la Toscane! Nous garderons un excellent souvenir de ces vacances! Going out of A11 motorway at Pistoia, follow the signs to Empoli and Vinci, then to Quarrata and Santonuovo.At the traffic lights in Santonuovo,turn on your right to Montemagno driving straight on. Pass by the hamlet of Montemagno and after 100 meters turn on your left in via Noci. Go ahead for 200 meters. Here we are to welcome you! We can suggest interesting tours both for nature and art lovers. We have links with restaurants, oil and wine producers and sports facilities (golf, swimming pools, tennis).